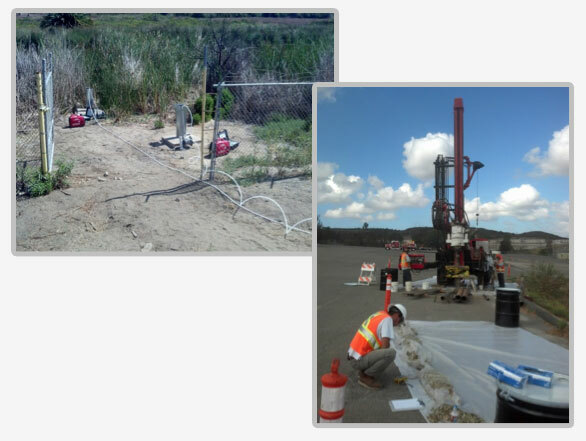 Pilot Study/Remedial Investigation/Feasibility Study - Noreas Inc.
NOREAS has performed a pilot study for enhanced in situ bioremediation of TCE using a dairy whey/edible oil emulsion mixture at IR Site 21 at MCB Camp Pendleton, California. The pilot study was designed to determine if this remediation technology can successfully treat low concentrations of TCE in a decomposed granite aquifer. Following completion of the pilot study, NOREAS and Parsons prepared a Feasibility Study for IR Site 21. IR Site 1115, also located at MCB Camp Pendleton, is comprised of several former UST releases over an approximate 15-acre former motor pool/vehicle maintenance and gas station area. Site contamination includes phase-separated hydrocarbons (gasoline and diesel) mixed with TCE and other chlorinated VOCs affecting both a shallower and a deeper aquifer. NOREAS installed four new groundwater monitoring wells at the site and completed groundwater sampling to address data gaps prior to completion of the RI/FS. Completion of the RI/FS is scheduled for late 2013.